No one wants to go around with bad breath. That is one of the reasons why many people use mouthwash. The mouthwash ads promise you fresher breath and a little flavor to go with it. And they do give you fresher breath. But most of the mouthwashes on the market today contain alcohol. Now alcohol is not a bad substance and it will temporarily kill the bacteria that cause bad breath. The problem is that alcohol also dries out your mouth. It is the nature of the chemical. When your mouth gets dry and produces less saliva, it leaves your teeth with no protection from plaque-causing bacteria. Right now, you are asking yourself, “So what if you have no saliva?"" The fact is that your mouth needs saliva to wash away the food debris that is left in your mouth and in between your teeth. When you have a reduced amount of saliva or no saliva, this process is interrupted and your teeth are left at risk. Another ingredient that mouthwash and some toothpastes have, is sodium laurel sulphate. This ingredient causes the foaming that you experience when you brush your teeth or rinse your mouth with mouthwash. It makes you think that the product is working. In fact, it doesn't mean that. This ingredient also dries out the mouth. And guess what? A dry mouth is one of the causes of bad breath because the food debris is sitting in your mouth and the bacteria is busy converting it to plaque. How Do Non-Alcohol Mouthwashes Work? 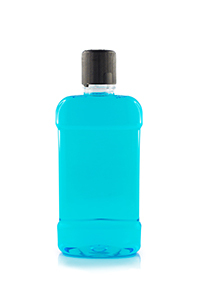 Non-Alcohol mouthwashes use a different chemical to control bad breath. That chemical is cetylpyridinium chloride. Unlike alcohol and sodium laurel phosphate, cetylpyridinium chloride does not dry out your mouth. The biggest benefit of non-alcohol mouthwash is that it leaves your saliva in place to do its job. If you have any questions, or if you would like to learn more, please call us today at (928) 277-0076.